1. The congress of Syriza took place in a context of growing political instability following the closure of the public radio and television broadcaster (ERT) by the government of Antonis Samaras and the departure from the government of one of its three components (the party of the Democratic Left, DIMAR). The new bipartisan government of New Democracy and PASOK can now only count on a very narrow parliamentary majority (153 votes out of 300), as shown by the vote in parliament on July 17 on the new package of budget cuts directed at the public sector. Furthermore, the scale of the public reaction to the closure of ERT has sounded the end of the relative apathy that had prevailed on the social front since the vote on the previous Memorandum last November. The ruling bloc has incontestably emerged weakened from this confrontation. The fall of the government under popular pressure appears to be a more realistic goal than it was a few months ago. But what is sorely lacking is a strategy and tactics that would address the question head on. The position of Syriza is in this respect at an incantatory level, marked by the gap between a rhetoric that is conflictual, but vague, and the line concretely followed at key moments of social confrontation over the recent period (strikes in the underground, the docks and secondary education aborted or broken, because of the measures of requisition taken by the government). In each case, the leadership of Syriza has shown great caution, avoiding any objective of a powerful rise of protest. This culminated in the withdrawal of support to the teachers’ strike, which was, however, approved by a majority of more than 90 per cent in exceptionally massive general assemblies. To do this, the party leadership imposed a forced march to the congress (with a delay of less than one month between the publication of the preparatory texts and the vote in local branches) and an agenda centred entirely on internal issues, far from strategic and programmatic preoccupations and from the imperative need to develop a programme corresponding to the demands of such a volatile conjuncture. the question of what are called the "components" with an ultimatum of two or at the maximum three months for their dissolution in the framework of the process of "unification" of Syriza . a right of tendency gutted of its substance, with the suppression of the so-called "separate lists", a roundabout way of designating the proportional representation of minorities in leading bodies. the method of electing the president of the party, i.e. by congress and not by the leading bodies (the central committee). 3. This internal agenda makes sense only if it is located in the wider perception of Syriza by representatives of the majority bloc and of the internal evolution that the party has undergone over the last year. For the media and the political forces that are part of the system, the "components" and "tendencies" of Syriza, its famous "cacophony" are code words for the radicalism of Syriza, which these "tendencies" embody, faced with a leadership (embodied by Tsipras) which represents the "realism" and the line of re-centring. The leadership, especially Tsipras, is under constant pressure from the system to "clean up" the party and to assert his authority ("Tsipras, cut off some heads" is a one of the favourite injunctions of authorised media commentators... ) by getting rid of dissenting voices. Those who are particularly targeted are those who criticise the leadership from the left and are presented as obstacles to the "image" of Syriza as a "responsible party of government." Even within Syriza, the spectacular electoral success of spring 2012 has produced a contradictory dynamic. On the one hand, there has been a significant wave of recruits (the number of members has approximately doubled in a few months and has now reached 35,000), as well as success in some areas, particularly in the workers’ movement, a traditional weak point of Syriza -- relative success, however, since its presence in the unions remains significantly less than that of the Greek Communist Party (KKE), which won only less than 5 per cent of the vote -- about one sixth of the vote for Syriza. But this wave also has another aspect, much more ambiguous. In a society traumatised by the economic depression and formed by decades of "partyocracy" (the "system" forged by New Democracy and PASOK, which have alternated in power since the fall of the colonels in 1974), joining a party that appears to be at the gates of power can also mean the reconstruction of a clientelist relationship, coupled with a relationship of obedience to the charismatic leader. If this phenomenon is still far from representing a majority, it nonetheless alters in what is now a significant fashion the composition of the party and essentially encourages the proliferation of "passive members", who appear only on the day of the vote for the congress and whose link to the organisation is based primarily on the personal relationships they have with one or more local cadres. 4. This phenomenon, partly spontaneous and perfectly predictable for anyone who is familiar with Greek realities, was nevertheless clearly encouraged in the name of necessary "enlargement" by the party leadership from the autumn of 2012. The choices made at that time – the absence of any real activist intervention and of a party-building strategy, the choice of congresses and national conferences organised in haste, with a bloated number of delegates, similar to that of national or federal leading bodies, the building of strong networks of a personal kind around some leading cadres (usually also parliamentarians) -- inevitably lead to a "catch-all" party, as political scientists say, following Kirchheimer. In other words, an electoral party, with its internal life atrophied, mainly welded around its leader and a discourse from above, mainly addressed -- through the media –- to a "national audience", but always modulated in order to please the various "publics" (more "radical" and "lyrical" when speaking to the activists, more "sober" and "pragmatic" when it comes to meeting Schaüble and the IMF). 5. 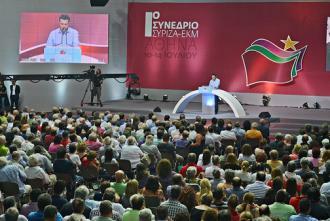 The most problematic aspects of the founding congress of this "new Syriza", a now unified party, arising from these profound tendencies, leading to its transformation into a "party of government" ready to run the country, are the following: a disproportionate number of voters compared to the participants in internal discussions, an unmanageable body of 3,500 delegates, no structured discussion during the first two days (the time when delegates could speak), no report on the activity of the outgoing leading bodies, an opening speech by Tsipras adapted to the demands of a an electoral meeting, not an address to a deliberative body of the party. To this was added the particularly aggressive climate towards the internal opposition (grouped in the Left Platform ), which culminated, on the evening of the last session of Congress, during the votes concerning the representation on the three points relating to the internal functioning on which the discussion was focused (dissolution of the components, representation of tendencies and method of election of the president of the party). There took place shocking scenes for a conference of the radical Left (representatives of the Left Platform booed, rude gestures and insults, Tsipras applauded every time he went up to the podium, before he had even begun to speak), which led to the departure from the hall of the delegates of the Left Platform and of a significant number of delegates from the majority. 6. What is the balance sheet of this conference? From the point of view of programmatic content and strategic development, very thin or nonexistent. The documents adopted merely repeat, often word for word, the formulations adopted (again rather perfunctorily) at the national conference last November. These compromise texts, replete with convoluted and ambiguous formulations, have in any case never really been distributed or publicly supported by the majority faction of the leadership, which is always eager to provide "interpretations" in accordance with the line of "re-centring" and "realism." Thus, last December, a few days after the national conference which confirmed the position of Syriza on the immediate cancellation of the memoranda by parliamentary vote in the event of electoral victory, those responsible for economic issues, and key figures in the leadership after Tsipras, made a whole series of statements to the media to clarify that Syriza "would not act unilaterally," avoiding systematically to use the terms "cancellation" or "abrogation", replaced by references to "negotiation" with "our European partners." Tsipras himself has increasingly made "conciliatory" statements of this type, especially during his trips abroad, above all in Germany, where he met Schäuble, and in the United States, where he met with representatives of the State Department and the IMF. 7. The Left platform tried to give a political content to a virtually non-existent programmatic debate and tabled four amendments which touched on the most sensitive strategic points: the debt (questioning the legitimacy of the debt itself, denouncing existing conventions and having recourse if necessary to cessation of payments in order to obtain its cancellation); the possibility of leaving the euro zone (a viable option that should be seriously prepared for, if, or rather when, a Syriza government finds itself, like Cyprus, facing the blackmail of the EU and the ECB); the nationalisation of the banking sector as a whole, a clear commitment to cancel all ongoing privatisation and nationalisation under popular control of strategic sectors of the economy (telecommunications, energy, road and airport infrastructure); a strategy of alliances that reaffirms the line of a left anti-austerity government, with no opening to the "centre" or the forces of the sovereignist Right. All of these amendments were rejected, but received between one third and 40 per cent of the vote, the amendments on the debt and the euro receiving the broadest support. In this sense, we can say that on the question of the political line, the leadership was able to impose its point of view. 8. However, given the objectives that it had set, this conference represents a serious setback. The agenda in three points mentioned above and focused on the "restoration of order" within the party had a rough passage at this founding moment of the "new Syriza". On the question of the dissolution of the components, and the ultimatum which was addressed to them, the leadership had to resort to a compromise (the wording adopted speaks of "dissolution in a reasonable time and after consultation”) following on the extremely firm attitude of Manolis Glezos. Emblematic figure of the Resistance, enjoying immense prestige and stature, as befits the national hero that he is, Glezos did not merely defend the right of the components to preserve their autonomy. He attacked Tsipras in a direct and personal way and strongly rejected the model of a "presidentialist" party, thus undermining the moral and symbolic authority of the leadership and of its leader. On the issue of minority representation, the leadership threw its weight into the balance, carrying out what can be called a coup de force led by Tsipras in person: after proposing a system that granted by a “technical” subterfuge an automatic advantage to the majority list, the majority bloc imposed on the (minority) tendencies who wished to present themselves as such an obligation to constitute separate lists, figuring on different voting ballot papers. The possibility that has existed up to now to choose, on a single ballot paper, a list and then to vote, within certain limits, for candidates appearing on the various lists, has been removed. As for the majority list, it is not presented as a tendency list, or an agreement between tendencies (although it is), but as the "unified list", simply an addition of individual candidates representing the "diversity of the party" as such. It was clearly intended that the minorities should appear as a "foreign body", merely tolerated, and that the majority list would be accorded a symbolic status of sole expression of the party’s legitimacy. The operation nevertheless turned against its instigators. Instead of weakening, the Left Platform has been significantly strengthened (see below), and, aided by the presence of small "independent" lists, it brought the majority list down to 67.5 per cent, seven points lower than at the national conference last November. Finally, on the question of the election of the president by congress, the leadership was successful, but at the cost of the adoption in the party constitution of a "flexible" provision allowing each congress to freely decide how to elect the president. Unsurprisingly, this congress subsequently decided in favour of the direct election of the president. But in the vote by secret ballot, Tsipras had what can be considered a counter-performance, totaling 72 per cent of the vote (74 per cent of valid ballot papers, virtually all the blank or spoiled ballot papers expressing various forms of rejection of the procedure and/or Tsipras personally). 9. We can however consider that the main setback for the leadership was the strengthening the Left Platform, which crossed the symbolic threshold of 30 per cent, an increase of nearly 5 percentage points compared to the national conference last November (30.16 per cent, as compared to 25.6 per cent), and this in a highly confrontational environment, entirely conceived with the aim of obtaining its marginalisation. There is no doubt that the climate of intimidation faced strong resistance from some of the delegates, beyond the ranks of those who had from the start supported the positions of the platform. The result caused a shock in the leadership, which avoided any official comment (its representatives became invisible after the announcement of the first results). The press and media reported the obvious embarrassment in the ranks of the majority, although in general, they try to go easy on Tsipras. The questioning is becoming more pressing as to the line that will be followed in the coming period, the search for compromise or further internal confrontation, this time at the risk of causing a prolonged internal crisis. For its part, the Left Platform for the first time released a separate communiqué stating that its efforts to obtain "the radicalisation and the anchoring on the left of Syriza and the unity of the whole of the radical Left were being pursued in better conditions." This is a sign that its success is seen as an encouragement to deploy its intervention in an even more visible way within the party and even beyond. 9 +1. In conclusion, we can say that the founding congress has probably created more problems than it solved, or attempted to solve. Now established as a unified party, with statutes, programmatic documents and an elected leadership, Syriza nonetheless appears as a party deeply divided over key strategic points, which are at the centre of a national and European debate. It is obvious that the confrontation between supporters of a "realistic" approach, anxious to gain power in a "cold" fashion, not to break with the European framework and to avoid confrontation with strategic sectors of the dominant forces, and those who advocate open confrontation and a break with the present framework of the EU, goes to the heart of the questions that are posed to the radical Left in Europe today. The essential contribution of Syriza and of the dynamic that it was able to create last spring, is to have been capable of posing in concrete terms, within the radical Left, the question of an alternative state power. It remains to be seen whether such an undertaking will be at the expense of radicality or whether it will join the long list of experiences of left governments which quickly became bogged down in the running of the system. The congress of Syriza was no doubt useful in that it has at least made it possible to formulate the terms of the problem in a way that is clearer and more easily understood by the social and political forces engaged in an emancipatory project. From 2004, the date of its creation, to the national conference last November, Syriza existed as an alliance between a dozen distinct components, covering almost the entire spectrum of the radical left. The most important of these components was Synaspismos, the party of Alexis Tsipras, which was itself made up of distinct currents, ranging from moderate social democracy (the present Democratic Left comes from there, but a significant part of this current remained in Synaspismos) to the neo-communism of the Left Current (see note 3). The Left Platform was established in its current form at the national conference in November 2012 by the convergence of two major components, with over a decade of existence, in various configurations: 1) the Left Current of Synaspismos, consisting essentially of militants who left the Greek Communist Party (KKE) in the split of 1991. It controls most of the workplace branches, the trade-union sector and maintains a strong presence in some branches and regional federations, mainly in the north of Greece; 2) the three components of Trotskyist origin in Syriza (Kokkino, DEA and APO), now grouped under the umbrella Rproject/Red Network. At the congress, DIKKI, a component coming from PASOK, joined the platform, as did an organisation of trade-union cadres (KEDA) who left the KKE in 1995. About a dozen Syriza parliamentarians out of a total of 70 support the platform, including one of the three spokespersons of the parliamentary group, Panayiotis Lafazanis, a former leader of the KKE and long-time member of parliament for the iconic second district of Piraeus, the most working class in the country, who is also the platform’s best-known public figure. July 30, 2013 -- Socialist Worker (USA) -- Greece's Coalition of the Radical Left, known as SYRIZA, held its first congress on July 10-14. SYRIZA shocked Greece and all of Europe in the spring of last year, when it nearly won two national elections -- it fell just short of the center-right New Democracy party and pushed the main center-left party PASOK into a distant third place. SYRIZA's appeal was its uncompromising opposition to austerity policies encapsulated in the so-called Memorandums negotiated with the "troika" of the European Union, European Central Bank and International Monetary Fund. The Memorandums bailed out Greece's financial system, but on the condition of devastating cutbacks, tax increases and layoffs. Greece has experienced new struggles against austerity in recent months, particularly surrounding the New Democracy-led coalition government's attempt to close down the state TV and radio broadcaster ERT. This revival of resistance was the setting for the debates about the future of SYRIZA that led up to the first Congress. Last year, from November 30 to December 2, SYRIZA held a delegated conference intended to prepare for the first Congress this year. Voting at the conference made it clear that SYRIZA has two main components: a moderate majority camp, with about three-quarters of the delegates, headed by leaders of Synaspismos, the main group involved in the formation of SYRIZA; and the Left Platform, with about a quarter of the delegates, mainly composed of a left-wing current within Synaspismos and a coalition of three revolutionary groups. Panos Petrou is a member of the socialist group Internationalist Workers Left (DEA), another of the organisations to co-found SYRIZA in 2004 and a leading force in the Left Platform today. He debates over political and organisational questions in the lead-up to the Congress and at the Congress itself -- and draws up a balance sheet of the outcome. The first congress of SYRIZA, held from July 10 to July 14, came at a very critical point. In June, the coalition government's closure of the public TV and radio station ERT provoked an occupation by workers, which in turn produced a huge wave of solidarity and revitalised the resistance movement against austerity. This struggle caused a serious crisis for the government. The Democratic Left -- known as DIMAR, a center-left party that formed in 2010 as a right-wing split from left reformist party Synaspismos, the largest group in SYRIZA -- withdrew from the coalition government, leaving behind the conservative New Democracy (ND) and the main center-left party PASOK, with, between them, a bare majority of 153 members of parliament out of 300. What's more, the government has pushed through further massive layoffs in the public sector, provoking a new round of struggles this spring -- another one-day general strike, several sectoral strikes and mass demonstrations by different groups of workers -- that may reach a new climax, if not during the summer, than certainly in the fall. Against this background, SYRIZA faces this question: How can the radical left claim governmental power without betraying its principles? The question can be answered concretely by looking at SYRIZA's alliances, its program, its vision for how it will win government power and what the call for a "left-wing government" would mean in terms of its tasks and duties. In the months leading to the July congress, the SYRIZA leadership, representing the majority current, gave many indications that it is moving further toward a moderate approach on these issues. For example, many leading SYRIZA members now talk about how, in the face of a social disaster, we must "save the nation first" -- by which they mean that radical left-wing policies and a socialist perspective must be put aside to the future in order to deal immediately with the crisis. Following this goal could put everything SYRIZA has stood for on the table. In social terms, it could mean a compromise with sections of the local or European ruling classes toward a project of restructuring the Greek economy (advocates claim such a project would be guided by the aims of "social justice," but that is a utopian impossibility in a time of capitalist crisis). In political terms, the proposals of the majority could lead to an alliance with center-left forces like DIMAR or offshoots from PASOK. One leading SYRIZA member has gone even further, discussing the possibility of a "national salvation government" that excludes only the neo-Nazis and the "far-right pro-Samaras faction" of New Democracy! The Left Platform tried to counter the proposals and positions of the majority during the Congress. The Left Platform is mainly made up of the Left Current, a tendency representing a left minority within Synaspismos; the Red Network, a front that brings together three revolutionary organisations -- the Internationalist Workers Left (DEA), Kokkino (which means "Red") and the Anti-capitalist Political Group (APO); plus unaffiliated activists within SYRIZA. The Left Platform articulated its different political direction in the form of amendments put forward as an alternative to the main political documents presented to the Congress by the majority. The first amendment was to the draft declaration of principles of the party -- the Left Platform proposed the need for a "second wave of radicalisation" for SYRIZA, both in terms of its program and its involvement in the resistance movement. * SYRIZA should repudiate the entirety of Greece's debt, support the cancellation of all loan agreements with the troika, and be prepared to use ending all payments if necessary to achieve debt cancellation. * SYRIZA should support nationalisation under workers-popular control of the whole banking system and all strategic sectors of the economy, as a necessary means to meet workers needs and confront the attacks on the working class by the capitalists. * SYRIZA should call for a left-wing government that must be ready and prepared for a rupture with the eurozone and the European Union. There must be a clear and public commitment to reverse austerity "by any means necessary," including an exit from the eurozone to counter the blackmail of the EU. * SYRIZA should stand for a united front of left-wing parties, including the Communist Party and ANTARSYA, but refuse to cooperate with any political forces or leading politicians who carried out or accepted austerity policies, including DIMAR. We must aim for a left-wing government and are not open to alliances with center-left parties, "democratic" center-right formations or right-wing parties that are opposed to the Memorandums. Unfortunately, instead of a serious discussion of these issues, the Congress was organised around internal, organisational aspects. The leadership of SYRIZA from the majority put forward the slogan of unification, with rhetoric about putting the party in the hands of its members rather than the component organisations, which was the basis of SYRIZA's organisation previously, as a coalition of radical parties. This false call for "unification" came with three concrete proposals. * All organisations that are component parts of SYRIZA must dissolve immediately. * Serious restrictions on the rights of internal factions and tendencies, mostly to constrain different "lists" of candidates for internal elections, which is how proportional representation for the groups within SYRIZA on leading bodies has been ensured. * Election of the chair of the party by the Congress, and not by the Central Committee. In support of these proposals, leading members of the majority camp of SYRIZA claimed that the component groups operated as organised parties within the party, and that they were the biggest obstacles to unity. The left-wing minority, which defended the right of component groups to exist within SYRIZA, was accused of being "conservatives" who don't want to put SYRIZA in the hands of its members. But there are no procedures and policies governing SYRIZA's functioning that are "obstacles" to democracy. Previously, the groups that formed the SYRIZA coalition had right of a veto -- this has been ended. So are the quotas for representation on leading bodies. The "one member, one vote" principle has been guaranteed within SYRIZA, and so has decision-making by majority rule. Despite the demagogy of members of the majority, SYRIZA's composition as a coalition of component organisations has never been a concern for people supporting or getting involved in SYRIZA, and it has never caused any problems with SYRIZA's functioning. So what was really at stake with these organisational questions? In essence, the goal of the SYRIZA leadership was to quiet dissent in a bureaucratic way. Behind the slogans for unity and the demagogy about putting SYRIZA in the hands of its members was an effort to marginalise any organised internal opposition. What is the political motivation underlying this drive? Ever since the elections last year, the component groups inside SYRIZA have become an obsession for the right-wing New Democracy and the mass media, who demand constantly that Alexis Tsipras impose discipline within his own party. As Stathis Kouvelakis, a prominent left-winger and member of the SYRIZA Central Committee, wrote recently, in the mainstream discourse, the "component groups" have become a synonym for the existence of organised radical, left-wing views inside SYRIZA. The demand that the "components" must be "dealt with" is, in reality, the ruling class demanding of the leadership of SYRIZA that it transform the party into a reliable and responsible force that can be entrusted with the reins of government. The same thing applies to the effort to restrict electoral rights for internal party tendencies and to elect the chair from the Congress, rather than the Central Committee. The quite obvious goal is to marginalise the Left Platform and to make Alexis Tsipras appear to be in complete control of the party. Unfortunately, the public discussion during the period before the Congress, and then the discussion at the Congress itself, focused on these organisational questions, obscuring the real political issues at stake. In the votes on the party's declaration of principles and the political document, all of the amendments put forward by the Left Platform were rejected. They won from 30 per cent to over 40 per cent of the vote. The amendments on repudiating the entire debt and on being prepared to leave the eurozone proved to be the most popular -- they were supported by over 40 per cent of delegates, a higher percentage than the organised forces of the Left Platform. But while the Left Platform's amendments were defeated, this should not be interpreted as the SYRIZA Congress deciding to "moderate" the party's program, as both the mainstream media and some other left-wing forces have claimed, each for different reasons. The political document presented and supported by the SYRIZA majority did not explicitly put forward more moderate positions compared to the previous program. The document was basically the same one that passed at last year's preparatory conference. Both documents have vague and vacillating language that allows for both left-wing and right-wing interpretations. It calls, for example, for renegotiating the loan agreements with the troika with the goal of cancelling the bulk of the debt -- rather than outright repudiation of the debt. It says that we don't wish to exit the Eurozone, but must be ready for any possible scenario. It calls for "public control" of the banking system, rather than an explicit declaration in favour of workers-popular control. What the Left Platform fought for was the radicalisation of the current program -- to make a more explicit commitment that would not allow for moderate interpretations. In this sense, the vote at the Congress on political issues was not a turn to the right, but a refusal to abandon the status quo for a more radical and more explicit declaration. The other factor involved in the vote on the amendments was the wider attempt by the majority to push its proposals through in the name of "unity," and to show support for the SYRIZA leadership against its critics among the left-wing groups within SYRIZA. Disappointingly, a section of the delegates was determined to vote on this basis against anything proposed by the Left Platform. But it is also true that the content of the amendments probably has a wider support inside SYRIZA than was reflected by the voting in such a polarised atmosphere. Dissolution of organisations: The proposal was for component groups within SYRIZA to dissolve in two to three months' time. Some organisations chose to dissolve immediately or at least to no longer have a distinct public face. Among the SYRIZA groups that rejected the ultimatum was DEA; the Movement for the United in Action Left, a group of unionists that split from the Communist Party in the early 2000s; and and Active Citizens, a group led by Manolis Glezos, a leader of the anti-Nazi Resistance during the Second World War. Glezos gave a powerful speech at the Congress that not only challenged the right of the SYRIZA majority to decide what other organisations should do, but also warning about the danger of a party centered around a single leader. During the voting on this question, there was a very heated debate, with most of the attacks centered on DEA for refusing to dissolve. We stood our ground against this measure, and we had some crucial allies, both from the Left Current within Synaspismos, and from ANASA, a tendency within SYRIZA that represents the left wing of the majority camp, comprised of libertarian communists; the left Eurocommunist group AKOA, which decided to dissolve; and unaffiliated members of SYRIZA. These comrades defended DEA and its contribution to both SYRIZA and the social movements, as well as other component groups and the importance of the various ideological currents that they represent. DEA's explicit refusal to dissolve and the reaction of other comrades who supported it forced the leadership of SYRIZA to resort to a compromise: The proposal was amended to say that the future of groups within SYRIZA and how they operate will be decided only after "mutual consultations" that will take "some reasonable time." Electoral rights for tendencies: Tsipras himself tried to eliminate the use of different electoral lists for elections to leading bodies of SYRIZA. When this met with fierce reaction from the Left Platform, he proposed that elections should be held based on entirely separate ballot lists. The effect is to present the Left Platform or any other opposition as outsiders who are against the party as a whole, since the majority doesn't present itself as a tendency or alliance of tendencies, but as the unified ballot. Until now, SYRIZA elections have had a single ballot, with various lists contained in it. This gave delegates the choice to vote for a whole list, but also to choose, in a limited way, candidates from both lists. The Congress adopted the Tsipris proposal, but in the end, the idea backfired on the leadership. Many delegates who aren't part of the Left Platform refused to be identified with the "unified" majority ballot. "presidential majority": As a result, there were six different ballots for delegates to choose from. Four of the ballots won around 1 per cent of the vote or less, and received one or two seats on the Central Committee in three of the four cases. The "Unaffiliated Members of SYRIZA" list got 1.03 per cent of the vote and received two seats on the Central Committee; the "Communist Current" got 0.74 per cent of the vote for two CC seats; the "Intervention of Members" got 0.27 per cent for one CC member; and the "Intervention for Unity" got 0.21 per cent and no CC members. Because so many delegates were shocked by the arrogant behaviour of the majority camp during the Congress, the Left Platform increased its representation on the Central Committee, winning 30.15 per cent of the vote for its ballot list -- up from 25 per cent in December. It has 60 members on the Central Committee. With the influence of the Left Platform plus the appearance of small "independent" ballot lists, the so-called "unified" ballot won 67.6 per cent of the vote in elections for the Central Committee, down by 7 per cent from the conference last December. Election for SYRIZA chair: Many members and forces within SYRIZA, including inside the majority camp, agreed with the criticism that it is against the traditions of the left wing to have a "leader." The Left Platform and others argued that if there has to be a single leading figure in the position of party chair, that person should be elected -- and, more importantly, controlled in between congresses -- by the Central Commiitee. In the end, Tsipras and the SYRIZA majority won approval of its proposal for Congress delegates to elect the party chair. In order to win this argument, however, the leadership had present the issue as an extraordinary circumstance for the coming year -- that right now, SYRIZA needs a strong leading figure in order to appear as a united party and to contest upcoming elections. It was agree that each Congress will decide the way to elect a party chair. In the end, the victory on how to elect a chair was Pyrrhic. Though he faced no serious opponent -- there were two other purely symbolic candidacies -- Tsipras won only 72 per cent of the vote. The rest of the ballots for chair were mainly blank votes, expressing disapproval of either Tsipras or the electoral process. In terms of SYRIZA's program and political stances, the majority camp won a victory. The leadership succeeded in defeating more explicit left-wing statements on the issues, and maintained the vague program. As state above, because of the vagueness, the real issue is how SYRIZA's program is interpreted, particularly by the "TV stars" of the party who are interviewed in the media and usually chose to portray the party program in a more moderate and "realistic" direction. But on the central issue of contention at the Congress -- the attempt to marginalise and even expel dissenting voices, it is clear that the leadership has failed, at least for now. The mainstream media were all set to declare that the Congress of SYRIZA had voted in favour of moderation -- that Tsipris had won and the left wing was tamed. But the outcome of the voting, especially on organisational questions, forced them to admit that the leadership faces a strengthened opposition. Drawing up a balance sheet is complicated, therefore. On the one hand, we saw some serious efforts toward transforming SYRIZA into another type of party, with less radical and political positions and less tolerance for debate and discussion. The aggressive attitude of the leadership toward the Left Platform; the emergence of a bloc of delegates prepared to support the leadership no matter what; and the rhetoric about facing an "emergency situation" which requires setting aside left-wing principles are worrying signs. On the other hand, we also witnessed what can only be described as a rebellion against the prospect of such a transformation. The defeats and retreats of the majority camp on a number of issues; the significant increase of the percentage of votes for the Left Platform, particularly in the context of the systematic effort to marginalise it; the fact that the majority camp isn't as homogenous as it once appeared -- all of this proves that the battle over the direction of SYRIZA isn't over. With angry protests exploding on the streets of Brazil over the past several months, we can see clearly the limits of the strategy of the Workers Party (PT), with its roots in the country's working class and left-wing movements. Yet the PT has sought to overcome ruling class resistance to its rule by appeasing the capitalists with broad alliances and moderate policies. SYRIZA needs to take the alternate path. The radical left in Greece should aim to come to governmental power against the will of the ruling class -- as the representative of a massive social and political movement, through its commitment to a left-wing program that will inspire the working class. * To the SYRIZA leadership, that it will face a strong internal opposition in any attempt to "turn right." * To the ruling class, that SYRIZA will not be easy to tame. * And to other parts of the left, especially the Communist Party and ANTARSYA, that there is a strong left-wing opposition within SYRIZA that is waging a struggle they should support. The battle over the direction of SYRIZA goes on -- and as always since its formation, the development of working-class struggles will be the most crucial ally for its left wing.